Every summer, Tuscany turns into a big stage on which many influential artists of the musical panorama perform. This is the best season for enjoying many of the things Tuscany offers – a mix of emotions, adventures and entertainment! This summer is off to a start high a lot of expectations, thanks to the rich calendar of musical events, a paradise for music lovers of every kind. The Lucca Summer Festival, the most important event in Tuscany, returns this year in its 15th edition from June 29 to July 29, 2012 in Piazza Napoleone in Lucca. The parking lots around the city (several for free) are connected with a shuttle service to take you directly to Piazza Napoleone. For further information about the Lucca Summer Festival, visit the official website here. Il Pistoia Blues, the event dedicated to blues and rock music runs from the 12th to the 15th of July in Piazza Duomo in Pistoia. 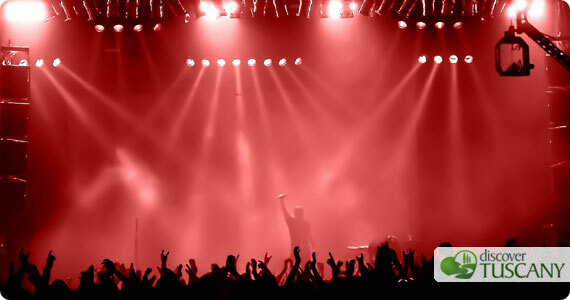 The event starts on July 12 with the concert of Subsonica, an Italian band and goes ahead with B.B. King on July 13th and Paolo Nutini on July 14th, while John Hiatt & The Combo will close the festival on July 15, 2012. You can reach Pistoia both by train as well as by car. By car you have to take the highway A11, exit “Pistoia”. The Opera Festival, the lyrical festival of Tuscany, started for the first time in 2004. It presents both opera as well as concerts of various kinds. The Opera Festival returns to San Galgano this year and adds two new venues: San Gimignano and the Artsenal of La Spezia. Swan Lake – July 19, 2012, Artsenal – La Spezia. The Barber of Seville – August 20, 2012 in San Gimignano, Piazza Duomo. And many more! View the whole program here. Il Festival Puccini is completely dedicated to lyrical music. It takes places in Torre del Lago from July 20th through August 25, at the Gran Teatro All’Aperto. As the name makes you suppose, it was created to render homage to the Great Master Giacomo Puccini. The Gran Teatro All’Aperto can host up to 3370 people, it is a beautiful example of a modern amphitheater within the Park of Music of Giacomo Puccini at Torre del Lago. To get more information about the Puccini Festival look at the official site. Jazz Wide Summer is a program of Jazz music which starts on June 9 and runs all summer to September 1, 2012 in Pisa at Argini e Margini, Scalo dei Renaioli. Among the most famous artists we find this year: Dan Kinzelman, Minus One Trio, Mattia Cigalini, Scala Nobile di Sandro Schneebeli. More info at the Jazz Wide Summer website. – Siena Jazz: from June 24 to August 7, 2012 it will host both Italians as well international guests. – Grey Cat Festival: from August 2 – 24 in Maremma. Among the musicians: Stefano Bollani, Danilo Rea, Noa, Hamilton De Hollanda, Living Coltrane Quartet, Enrico Rava and Fabrizio Bosso. – Vivere Jazz in Fiesole from June 20 through July 27, 2012 with international guests of the likes of: Richard Galliano, Dave Holland and Gilberto Gil. The festival of migrant culture and music returns this year from July 10 to August 24 in Arezzo. This 8th edition is dedicated to Woody Guthrie, a great popular singer-songwriter from America. Special guest will be Patti Smith, who will perform with the Aretine Casa del Vento on July 26, 2012 in Piazza Varchi in Montevarchi. More info at OrienteOccidente. From June 22 to the 30th head to the the 17th edition of the main festival in the area of Valdarno. Tonight (June 29), the Africa Unite! A Festival dedicated to the Via Francigena and its most beautiful places. Many concerts along the ancient Road from July throughout August, 2012. Read the program of the festival here. The new “Nuovo Teatro dell’Opera” in the Cascine Park is the setting for various concerts this summer in Florence! The Radiohead concert which was supposed to be this weekend, has been rescheduled, still at Park of Cascine, for September 23,2012. A Tuscan journey to the tune of music and now, it’s hard to choose just one, isnt’it?